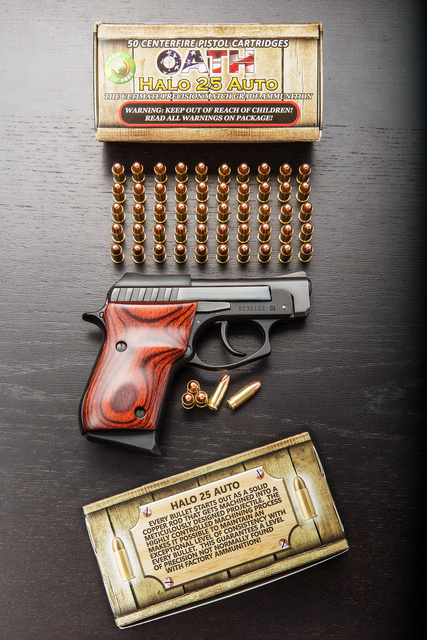 The point of 25ACP is to allow really tiny defensive guns. Plus side, they can be hidden anywhere. Minus side, not much stopping power — the wound track is similar to a pencil being pushed through, and that if it doesn’t ricochet off skull bones — and not a great aimed range when using pistols small enough to justify the caliber. While I can reliably hit a torso target at 25 yards with Baby Brownings, it’s not a weapon for distance. Typical use happens up close, and all considerations are secondary before reliability. Enter monolithic, lathe turned copper bullets loaded into turned (rather than drawn) cases. These are extremely uniform in dimensions, smooth and should feed and extract better than jacketed lead with drawn cases. Machined cases stand up to repeated reloading a lot better, too. Being less dense than jacketed lead, copper gives slightly higher velocity at the cost of lower performance at longer distances. 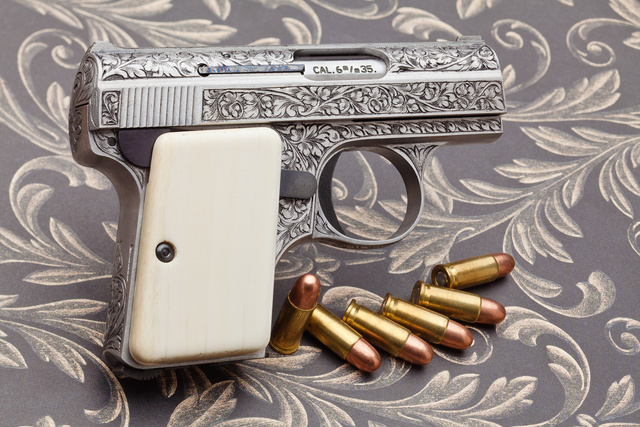 For 25ACP, looks like a viable trade-off. The Taurus pistol shown above is really too large for 25ACP. In that size, 32ACP is viable. Further, while the discontinued metal-framed version has a decent trigger, the polymer-framed variant has one the worst triggers I’ve encountered. It is too heavy and too sharp to fire without pain, and I couldn’t finish the magazine. So don’t use that model for self-defense. If you use 25ACP, Baby Browning variants, Beretta Jetfire and other models, or maybe a Seecamp would make more sense. I have no idea where OATH got the 800fps listed on the box. In my tests, it reached 960fps from a 2″ Baby Browning barrel. It’s possible that the production load is slower, but it’s unlikely to be below 900fps minimum. The reason for this load is not any great ballistic feats but maximized reliability in tiny guns. 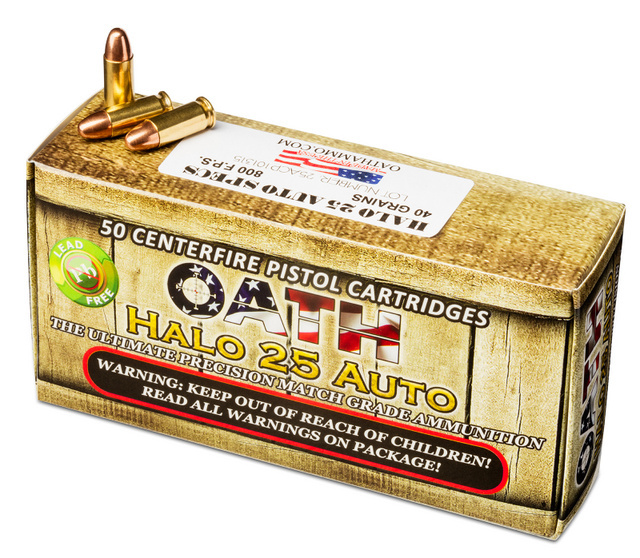 At $29 for 50 rounds from OATH store, they cost the same as Winchester or Remington loads, more than PPU, Fiocchi or Federal. 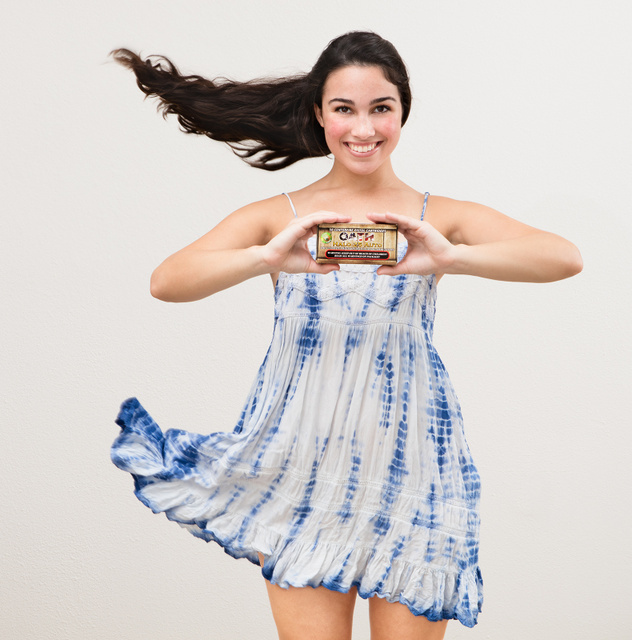 Given the reliability advantage, they might be worth the slight premium. This entry was posted in ammunition, pistol, self-defense, weapon and tagged 25ACP, OATH. Bookmark the permalink. 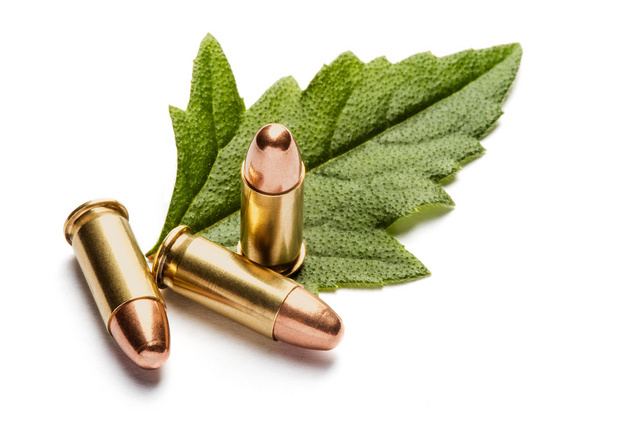 3 Responses to “Green” bullets. Oleg, I’m one of the very few people I know who reload .25 ACP, “for those times when you want to carry a gun without really carrying a gun,” as my old Hopkins, MN gunsmith used to say. At one time, Hornady made a 35 grain hollow point XTP projectile for the .25 ACP, which when loaded ahead of 1.7 grains of Bullseye, was a “screamer” in terms of velocity; as compared with 1.5 grains and the “normal” 50 grain round nose. What a concept! There is only “X” amount of work/power available from a blow-back action. To say that the .25 ACP is “not for distance” is an incredible understatement, as the highly concealed garter belt/vest pocket pistol was designed to be used as a last resort (by those of ill repute of both sexes – gamblers and men and women of dubious virtue) in a phone booth or elevator, where proper shot placement is a matter of reaching/punching out and not aiming for distance, such as across the room. Like a .22 rim fire, the projectile has a tendency to “skitter,” not to punch through, which can make it rather lethal, if not immediately incapacitating. Better than nothing; but not much. The .25 ACP was “scaled up” to the .45 ACP in the same way that the .50 BMG was scaled up from the .30 Caliber Government cartridge, or 30-06. Why waste a good design? I also recently came across a box of old Western (Blue and Yellow box) .25 ACP where the primers were dead, but otherwise clean. Perfect for salvaging the projectiles and cases with new, modern, primers and powder. Allow me, please, to say that turned projectiles in machined cases is “overkill” in the same way as an atomic flyswatter or $500 toilet seat or $200 claw hammer. I have never had a failure in many thousands of rounds of drawn cases, drawn jackets, and swaged lead-core bullets. I wonder if the claim that turned cases are more uniform is just marketing smoke. Are conventional match grade rounds made with drawn cases? What are the actual (as opposed to SAAMI) tolerances of cases from high quality manufacturers? Judging from what I’ve seen running a few boxes of ammo through a cartridge gauge, the more expensive (e.g., self defense) rounds are impressively consistent. Yes, Brand X rounds aren’t, but that’s hardly a sensible comparison. And even if they are more uniform, is that reduced tolerance (again, compared to conventional high quality ammo) actually useful? In other words, does it actually make a difference in accuracy? Regarding the .25acp Beretta Jetfire/950BS, I would caution that it needs to be shot at various distances with paper targets to determine if the bullet tumbles, and at what distance. When they made them in the US in the 80’s, they had some problems that didn’t seem to bother the company any. I shot three brand new ones then, none of them close in serial number. One would punch round holes at 25 yds, one would tumble by 15 yds, and one by 5 yds. The mag release button protruded so far above the grip, that I could drop a mag with either hand, just by gripping the gun normally. If it has an oem barrel latch lever, DO NOT carry it in a holster. It is easily moved by friction while drawing from a holster, and the resulting spring loaded pop up barrel will lock it solidly inside the holster. It will not be removable until you crush the holster to force the barrel back into its latched position. The finger pad on the outside of the lever needs to be removed, to avoid this problem. Those were not the only problems. It’s a nice little gun, and the pop-up barrel feature is useful. It was pointed out to me at that time that Beretta was busy with the US military handgun orders, and they were not paying attention to anything else. A sad commentary on how not to run a business, especially in the US gun industry.